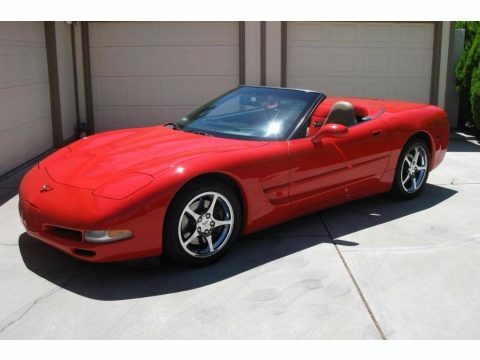 1999 Chevrolet Corvette For Sale in Carson City, Nevada 89706 For the past 50 plus years, the Corvette has been America's sports car. Chevrolet's Corvette Convertible offers one of the most formidable blends of performance, panache, and price on this planet. (Or, as far as we know, any other.) Unlike most convertibles, this '99 Corvette ragtop weighs the same as its coupe counterpart, which means its acceleration performance is undiluted: 0-to-60 mph in less than 5.4 seconds with the smooth transmission. While the basic concept is the same as it was back in 1953--a two-seat plastic-bodied all-American sports car--the C5 shares almost nothing with the previous-generation Corvettes. The 5.8 Liter V8 engine is potent. It produces 350 horsepower and 350 foot-pounds of torque. If stares of envy are part of your sports car enjoyment, it's hard to imagine a better choice than this ragtop Vette. It offers a comfortable cabin, something that wasn't always true with previous-generation models. Getting in and out is far easier than in the old days and there's more room for the driver and passenger. Obviously, there is more interior noise in the convertible than the coupe. However, this is a sports car and noise--particularly the calculated growl of that terrific V8 --is part of the deal. If you want quiet, go to the library. Need we say more? Practice your Vette wave on the way down here. You could be driving this baby home today! Call (402) 502-8385 for more information today! Seller’s Notes: Beautiful convertible, tan top, with 2002 Corvette wheels. New Michelin run-flat tires (Les Schwab) at 48,454 miles. Front and rear brake job at 48,000 miles. New driver and passenger leather seat upholstery and foam installed October 2012. Black dash cover. Front end from back of doors forward repainted in February 2012 (dust storm) (NOTE: body side molding on doors were removed at that time and; repainted primer gray and are in the trunk). We have all our receipts and receipts from the previous owner.